This diagram doesn’t really give you any measurements, its more a guide on what I like to feed my beef stew with. I have learnt that these ingredients work splendidly together and, by adding a small amount of cocoa at the end, really makes this dish into something complete. This Beef Stew can be served with rice or just a piece of bread and a salad. Sometimes I make it as a bolognese and use minced meat instead. 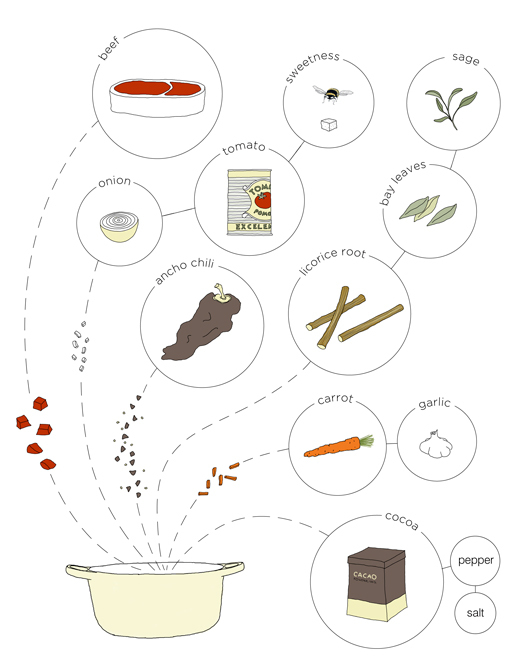 This Recipe Diagram is my submission for GOOD’s Redesign the Recipe project. If you like it you may vote for me. Thanks! See more Recipe Diagrams here. This image is also for sale in the SHOP. Wonderful Deborah! I wish you all the best too! Good luck! Always willing to help a fellow Scandi out! Love that you’re doing a few more of these! Always enjoy your work. Really, cacao powder? Yes. Cacao with licorice is great. I add the cacao at the end and its just completes the dish! Thanks Alex for you lovely words. Looking forward to see your post tomorrow. And thanks for telling me. It would be so sad if I missed it! Hej! I just tried to vote for you but the voting thing doesn’t seem to work. I’ve left them a message about it. I love the idea of liquorice and cocoa in there. Your illustrations remind me of Swedish embroidery for some reason, something I must have seen as a child maybe? Anyway – I love them! Thanks Joanna! I will keep an I on how GOOD.is solves the problem. Cocao in a beef stew?! now that’s interesting. its not that strange: the ancho chili already have some chocolate tones… by adding cocoa it just makes that flavor stronger.